The Shultz Hour reminds me very much of what we refer to as the Power Hour in our Personality Type and Time Management training. 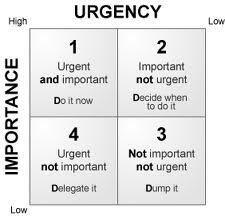 While much of the course applies principles of personality type to improving productivity, we do consider the well-known Covey Matrix which plots the importance of tasks against their urgency as illustrated below. We add a little more to the Shultz approach of sitting down with just a pad and a pen. We encourage a review of what appears in the Important but Not Urgent (2) quadrant during the Power Hour. This is where we find tasks piling up relating to planning, long range goals and personal development. Covey suggests that high performers spend a much greater proportion of their time compared to their more typical counterparts in this quadrant. Shultz served as secretary of state in the 1980s. A good portion of young professionals with whom I work today were either very young or not even born when Shultz, now 96, served. For their benefit, here is what this old-timer has observed over the last thirty-five years. While technology has promised to make our lives easier, the opposite has happened. With smart phones as a fifth appendage we are always on call with some of us unfortunate enough to be getting work-related e-mails and texts at all hours of the day and all days of the week. Leonhardt writes about one lost soul who was sending out work-related e-mails while his child was being born and then boasting about it. Enough! Stop! The Shultz or Power Hour has never been more important. Find one and find a place where you will not be interrupted. Try not checking your phone for an hour and instead focus on what is important but not yet urgent. You will be rewarded with both higher productivity and improved mental health.